Tax Calendar is an interactive tax reminder for your website. Tax Calendar is a great way to ensure your clients and prospects never forget their tax dates, and it’s a valuable resource which will help attract and retain website traffic, generate leads and enhance existing client loyalty. 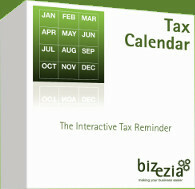 Bizezia’s Tax Calendar is a value-adding website tool which interactively displays relevant tax dates. Tax Calendar is not only a useful resource for your clients and prospects; it goes one step further by giving users the opportunity to request more information from your firm using the Contact Us feature. This innovative technology brings new business to your door. The Tax Calendar contains 3 different calendars for different types of user: self-assessment taxpayers, companies and employers, partners and partnerships. The calendars are simple to use with colour-coded clickable graphics to represent the tax dates occurring. You can access any of these views from all parts of the calendar. year view, month view and list view. We’re very sure that you will gain real value from Tax Calendar. That’s why we have the confidence to guarantee it. If you’re not happy with any part of the Tax Calendar, please don’t hesitate to let us know. We guarantee that we will make it our absolute priority to ensure that the product matches our own high standards. There is no set-up fee for Tax Calendar, just an easy and affordable monthly or annual payment option with a minimum 12 month subscription. With no set up fees, free support, choice of colours to match your website, online on-demand delivery through your website, Tax Calendar is £9 per month or £97 a year.